Think your cat has a cold? It just might! It is not quite the same as people catching a cold, but the symptoms are very similar. The runny eyes, sneezing, gagging (from sinus fluid running down the throat), and pawing at the face are some signs of an upper respiratory infection or URI. This type of infection is most commonly caused by feline herpes, calicivirus, or sometimes a bacteria. These are just general symptoms and can lead to other diseases as well. Some cats that have URI have been in contact with other cats recently. These include shelter cats, catteries, boarding facilities, and veterinary hospitals. It is more often seen in kittens, as their immune system is not as developed as adults. Stress can also be a factor for adults, as this weakens the immune system, just like humans. 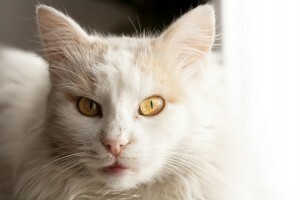 Stress from grooming, boarding, and surgery can make your cat more susceptible. The vaccination that your cat receives on its routine trip to the veterinarian helps lower the chances that it will catch an URI. Much like the flu shots people get, the vaccination protects against the most common sources, but unfortunately not all. The treatment for a URI is antibiotics, if a bacterial component is suspected, otherwise the treatment is based on symptoms, i.e. something to help reduce the drainage and congestion. With treatment, the symptoms begin to go away in several days. Keep your cat on the full course of antibiotics and other medicines, stopping too soon could cause a relapse or help create more resistant infections.